On Friday, April 15th, 7th-grade Life Science students capped off a unit on biodiversity with a visit to Sea Life Aquarium at Legoland. Over the last several weeks, the budding biologists have observed sponges and planarians, dissected earthworms, experimented on snails, and explored the water vascular system of echinoderms. 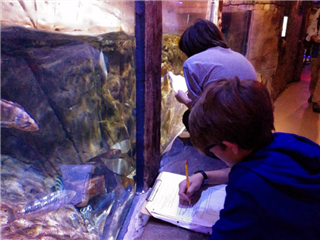 At the aquarium, students got an up close look at many of the invertebrates they have been studying in class. The group also had an opportunity to put their classification skills to the test by identifying the dozens of species they encountered. Highlights included a very active cephalopod (octopus) getting "hands-on" in the touch tank, and of course, the sharks!